Before we get into the meat and potatoes I must warn you all that this is going to be a spoiler-filled post. Now you know, if you read on and this ruins anything, that is your own dang fault and you will have to live with that guilt and shame for the rest of your life. I know I am not alone in saying that the wait for Stranger Things Season 2 was almost unbearable. It was stress caused by the need for the second season to be as good as the first season and the fear that it wouldn’t be. In my opinion Season 2 not only lived up to the first season, but surpassed it. I felt that this season was the glue that holds the rest of the series together. I know there are those out there that felt that episode seven was a throwaway episode, but you are wrong. Look at what the Duffers have done in the show up until this point. Nothing is trivial, nothing is thrown away. Do you honestly think that is the last we see of Eleven’s sister Kali? Do you think that she is the only one out there with powers? I am done with that subject for now, but that is not what this post is about so I will now get into the nitty gritty of this. "…I want is Jim to get back into some punching mode for Season 3. He didn’t punch anyone in Season 2! I would definitely like him to be running around Hawkins, punching people. The Duffers and I have talked about that for future seasons. We’ve also seen a lot of things, when Eleven goes down to his cellar and sees the boxes, we see a box that says Dad, a box that says New York, a box that says Vietnam. These are little Easter Eggs for Jim, further layers of the onion that can be peeled back. More will be revealed on that front." Hopper has a lot of demons in his life and I thought the boxes in the cellar was a beautiful way of showing that. 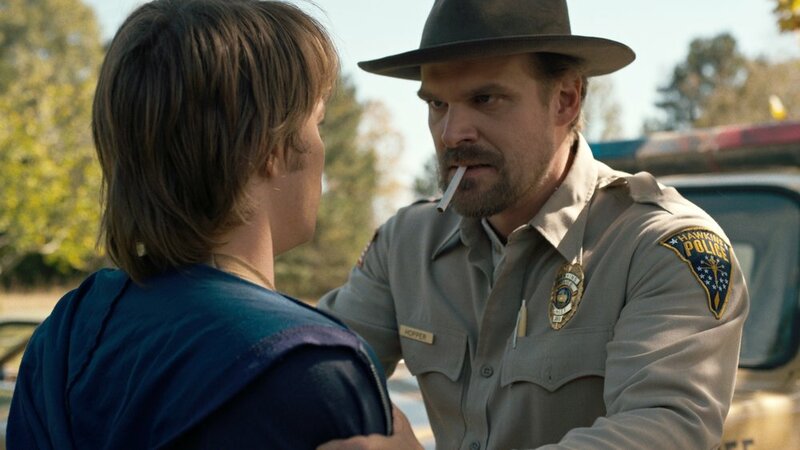 Hopper is a fighter, he is willing to throw down any time any place to protect what is right. That is great, that is what Hawkins needs at times and it will be great to see if the Duffers bring that out of him in future seasons.